The misconception that since marble is a stone it does not need any maintenance is far from the truth. All marble needs some type of care and maintenance. Though some marbles are harder than others, marble of all types is generally a softer, calcium-based stone, susceptible to scratching, etching (acid damage), and general dulling of its appearance if not maintained properly. Marble care needs vary depending upon type, purpose, finish and location, which is why it is important to work specifically with stone restoration professionals if it is in need of care. An uneven finish, dull spots, scratches or etch marks (sometimes mistaken for water marks or spots) can diminish the elegant appearance of your marble floors and surfaces. Natural Stone Care can hone your marble surfaces to eliminate these imperfections, resulting in a new marble surface free of damage. We can then polish your marble using the appropriate diamonds or polishing powders to restore the finish you want, whether matte, semi-gloss or gloss finish. With our marble honing and polishing services, our expert technicians can achieve the exact finish you are looking for. Uneven tiles don’t just diminish the look of your floors, they can also create a trip hazard. Natural Stone Care can grind away the excess stone (a process called lippage removal) to create a flat, level surface using state-of-the art diamond grinding technology. This can also be done to bring all tiles more level with grout lines to facilitate easier cleaning. No matter how careful you are, spills can still manage to happen. And sometimes spills become stains. Whether you are seeking guidance on how to remove a stain yourself or want us to take care of it for you, we are experts in removing stains from marble. Something to note: please do your research before starting any DIY stain removal process, since certain cleaning solutions may damage your stone or even permanently set the stain. Are you familiar with the adage, “It’s easier to keep something clean than it is to get it that way?” Your marble surfaces are no exception. Marble is easier to keep clean with periodic professional deep cleaning services, and the proper day-to-day cleaning methods and products. We are happy instruct you in the proper care methods and products that will help keep your marble surfaces looking great. Natural Stone Care also provides regularly scheduled maintenance programs, upon request. 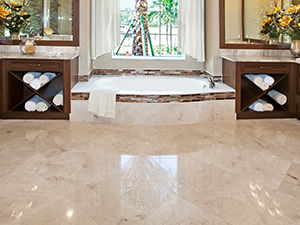 Once your marble floors, showers, tub surrounds, walls, and other marble surfaces are cleaned and restored, we highly recommend you have Natural Stone Care seal them to enhance their stain resistance. While most stains can be removed, marble stain removal can be a time consuming, expensive and often frustrating process. Sealing represents an inexpensive, preventative measure against marble stain damage. Do you have chips, holes or cracks in your marble surfaces? Before you replace, consider taking advantage of our expert marble repair services. Natural Stone Care can fill holes and fix marble cracks and chips, blending the repair site with the surrounding area, and honing and polishing it to match the surrounding finish. Although it is rare for a marble tile to be beyond repair, sometimes tile replacement is necessary. Natural Stone Care’s craftsmen can, in many cases, remove your affected tile without damaging neighboring tiles, install the replacement tile, level it with the surrounding area, and then match the finish as closely as possible. Marble is an elegant stone highly regarded throughout history for its beauty and versatility. From the temples of ancient Egypt to the basilica of Saint Paul in Rome, marble has been the stone of choice in some of the world’s most breathtaking architecture. It comes in many colors with different and beautiful veining, though some varieties may not be veined.Today, marble continues to add character and aesthetic appeal to art museums, cafes, workplaces, and homes. Whatever your marble surface or care need, you can rely on Natural Stone Care to provide expert and knowledgeable service help keep your marble looking its best. For a free estimate on marble floor polishing, marble countertop cleaning and sealing, or other marble restoration and refinishing services throughout our service areas (Newport Beach, Orange County, Riverside County, San Diego, and San Francisco Bay CA) contact us online or call (866) 985-0211 today.